Mischief managed! 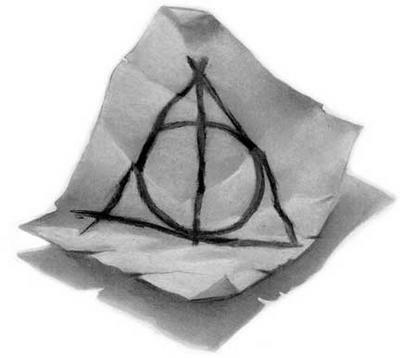 On the eve of the final film’s release, we conclude our Seven Sacraments of Harry Potter series with the final book’s namesake, The Deathly Hallows, the three folkloric and instrumental relics of magic which enable its beholder to cheat death, in costly ways. The Master of the three Hallows is the Master of Death. As a word of caution to those who have not yet read Harry Potter and the Deathly Hallows (for shame! ), or would prefer not to be made aware of insights, theological or otherwise, related to the final part of the saga, this is your spoiler alert! That (tale) is a children’s tale, told to amuse rather than to instruct. Those of us who understand these matters, however, recognize that the ancient story refers to three objects, or Hallows, which, if united, will the possessor the master of Death. Dumbledore turned his whole body to face Harry, and tear still sparkled in the brilliantly blue eyes. He would not think that he needed the Cloak, and as for the stone, whom would he want to bring back from the dead? He fears the dead. He does not love… Voldemort, instead of asking himself what quality it was in you that had made your wand so strong, what gift you possessed that he did not, naturally set out to find the one wand that, they said, would beat any other. For him, the Elder Wand has become an obsession to rival his obsession with you. He believes that the Elder Wand removes his last weakness and makes him truly invincible. Just like the other two Peverell brothers, it is this flaw in Voldemort’s logic that undoes him. His quest for power has left him looking for a tool which will make him eternal, rather than seeing in Harry the quality that makes him supreme. That quality, more penetrating than the power of a wand or a life-giving stone, is love. Harry, marked by the love of life lain down, carries that love and is compelled to do the same. Harry, in the name of love, lays down his life so that his friends might live. Because Harry has given himself up, he has gained it all. I was afraid that your hot head might dominate your good heart. I was scared that, if presented outright with the facts about those tempting objects, you might seize the Hallows as I did, at the wrong time, for the wrong reasons. If you laid hands on them, I wanted you to possess them safely. You are the true master of death, because the true master does not seek to run away from Death. He accepts that he must die, and understands that there are far, far worse things in the living world than dying. Thanks for doing this series! I’ve really enjoyed reading & watching Harry Potter, and it was nice to see a Christian perspective that was friendly to Harry Potter! Love this piece and really appreciated the series as a whole. It’s been probably the best analysis I’ve read so far – avoiding allegory (the in bad sense) and a genuine respect for the source material.